Manufactured in Italie from 1953 until Circa 1957. 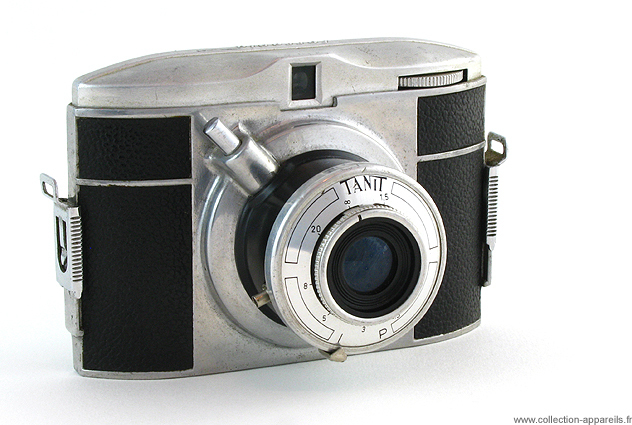 Like the CMF Bencini of the same period to which it resembles, this very simple camera is made of aluminum. It is, however, covered with black leather. It is a half format on film 127 making 16 views of 3 x 4 cm. The lens is not telescopic. Aesthetic in its shapes, materials and contrasts (lines-curves, leather-aluminium), the Tanit has an astonishing convex-concave hood as well as an original and beautiful character cast.